More often than not, government internet projects are synonymous with low ambitions and high spending: vast, sweeping schemes that make only minor tweaks to the status quo, cost the earth and end up leaving citizens drowning in a quagmire of bureaucracy. What’s the best way of challenging that stereotype? Step forward Britain’s brand new gov.uk, a service intended to smash those perceptions, help get citizens the information they need — and save money for tax payers. The site, which went live overnight, is simple in the extreme: instead of a complicated nest of subject areas and atoms of information — the approach that typiied the previous one-stop shop, Directgov — it is a Google-like search bar that takes you directly to the information you need. Canny autosuggest options mean that keywords can be useful, while larger subjects of interests are clearly pushed without. It is, effectively, the difference between the Yahoo and Google of old — one is a contents page for information that forces you to interpret somebody else’s filing system, the other is an index that allows you to find what you’re looking for more directly. 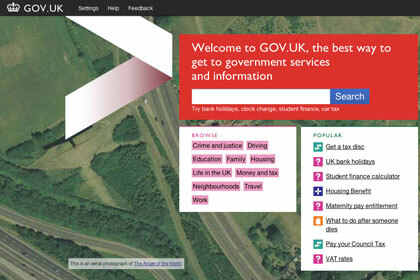 If you want to get an idea of this change, here’s a comparison between Directgov’s homepage (on the left) and Gov.uk’s (on the right). It’s probably the biggest concrete example so far of the British government’s commitment to using technology to make the nation a better place. So far Prime Minister David Cameron has been keen to court technology businesses and use the rhetoric of a high-tech future as part of his campaigning, with only minimal real impact or action.There have stunts aimed at projecting a futuristic — such as the development of a custom iPad app for Cameron to monitor national performance — and the creation of a pseudo-public body to promote London as a technology hub. In reality, though, that commitment has wavered, not least when the Prime Minister decided to close down a proposed open data research organization to be led by Sir Tim Berners-Lee, before starting it up again amid a huge PR push. But Gov.uk — which is still in beta, for now — seems like a good step in the right direction. I just used it to find and fill out some forms that I needed to send, a task that would have taken a few minutes in the past: now it took just a single click to get to the right place. And it’s all been done on a budget of £1.7 million, a far cry from the British government’s most infamous technology white elephant, when it famously spent years preparing a new IT system for the National Health Service that saw its costs balloon from £2 billion to more than £12 billion ($19 billion) — before the financial crisis loomed and the project was duly cancelled. This change is only just beginning, and it hasn’t come without some friction. Jobs have gone in the civil service as the organization effectively used smart technology to replace humans in charge of huge libraries of media materials that were rarely seen by the public. And it may be too much of a stretch to imagine ministers used to the privileged, dusty corridors of Westminster talking about Hadoop clusters and agile operations. But ultimately it’s a smart, sharp product, and the focus on getting users what they need, faster has got to be good news. An example for other countries to follow?